Joyful Finds for the Weekend, Vol. 72: The Fall Edition! But over and over again, I found myself falling in love with the "imperfect" ones. Leaf after leaf was a little crinkled, a bit torn, or quite curled up at the edges. the closest we can get to perfection. "Here I am; my flaws are etched upon my skin. Will you take me anyway?" Fall reminds us there is beauty to be found even in our own scars. My goodness...it's so LOUD out there, isn't it? I need the stillness of the early morning even more now. I need to know there really are peaceful things in the world, things not yelling and clawing and thrashing for our attention, things that are just there...just being. I need to focus (quite literally) on the quiet things. I knocked over two little old ladies to get to it. It's a short book, but there's a fair amount about musician Leonard Cohen spending years in a Buddhist monastery and finding out that "going nowhere isn't about turning your back on the world; it's about stepping away now and then so that you can see the world more clearly and love it more deeply." I've written here before about going on a news diet. Lately, I seem to be on a "binge and purge" cycle: Consume the morning news about all of the awfulness that took place while I was fretfully sleeping; feel nauseated and mad at myself for checking the news; retreat to an area (usually outdoors) with no news at all. I mentally and physically need these retreats from the news. As Pico Iyer writes, "Not many years ago, it was access to information and movement that seemed our greatest luxury; nowadays, it's often freedom from information, the chance to sit still, that feels like the ultimate prize." "The point of gathering stillness is not to enrich the sanctuary or mountaintop but to bring that calm into the motion, the commotion of the world." I hope you'll run, not walk, to your local library for this book. Careful of the little old ladies, though. Come say hello to me on Instagram. Another reason I want to visit Morocco: These goats in trees! I've written before about the Japanese art of forest-bathing, or Shinrin-yoku. Seems it's a new trend in the U.S. to break technology addiction habits. Autumn Quiz: Name That Leaf! "On several different occasions, I saw tourists just gushing over squirrels." The more pictures I take (goodness, I think I'm getting into the hundreds of thousands by now! ), the more I realize that I have an ever-growing soft spot in my heart for the underdogs of the natural world. The rough-and-crumbly things, instead of just the smooth-and-shiny. Overgrown gardens with weeds aplenty. I'm so plugged into social media for my blog that I'm hyper-aware of the constant barrage of "Perfect." Instagram perfect. Pinterest perfect. Facebook perfect. Martha Stewart must think she's died and gone to heaven, with the whole world rallying around her like angels, sharing their carefully crafted visions of perfection. 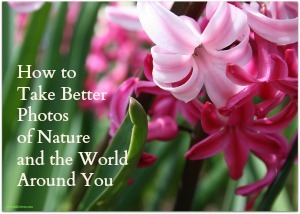 And, let's be honest here: I fully admit that I strive pretty darn hard to take "picture-perfect" shots for this blog. Because who doesn't like pretty things? I'm guilty, too. But here's the thing: I also want to embrace the "perfection-challenged." Curling leaves that have been gobbled up and heartily enjoyed by a bug (or two, or three). Faded blossoms that have been fried to a crisp by late-summer sun. There's a delicate beauty, a quiet grace, in time-worn things. And so I ask myself: What gentle, worn-down, perfectly imperfect thing is whispering for my attention today? Let me celebrate it, while it lasts. Tiny silver droplets on deep-green leaves. Just another reason that I don't mind the rain. It's been a very wet June around here (you could say "downright soggy"), but with droughts and the accompanying wildfires out west, I'm reminded of just how lucky we are to have the lushness, the intense greenness, the cooling rain. I hope your week is a refreshing one.